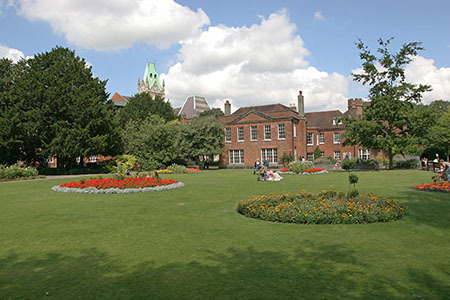 Beneath the lovely lawns of Abbey Park alongside the Broadway are the foundations of Nunnaminster, later known as St Mary's Abbey, founded by Queen Easlswith, King Alfred's wife. King Alfred would of course have seen to its building. 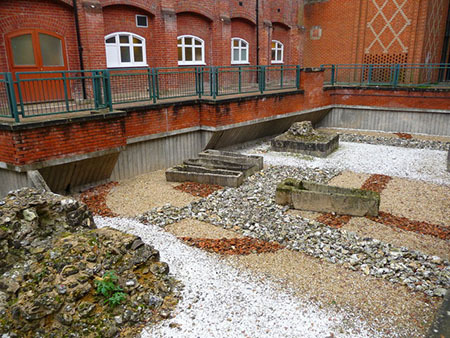 Next to the Guildhall is Abbey Passage where excavations of the Abbey made in the 1970's were left for people to see. There are plenty of infornation boards to explain. The Abbey was situated between High Street and Colebrook Street, close to the Minster and later the Cathedral. Not far also from the main Palace, her old home. Now a serene park loved by visitors and locals alike. What does remain of the old building faces Broadway, although it is not the original front, that faced the gardens. The one we see now is a later addition. These days it is the Mayor of Winchester's residence. He does not have far to go to work, the Council Offices are close by! Nunnaminster as a name was not surprising, for we had the Old and New Minsters near the Cathedral. A Minster was Saxon for 'a gathering of the clergy' so Nunnaminster became 'a gathering of nuns'. Under King Alfred Winchester had become the capital of not only Wessex, but England. 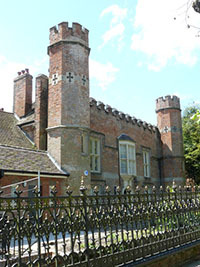 It was now an important centre for civic as well as church interests. As such Queen Ealswith would have realised that an Abbey was essential and valuable. Queen Ealswith herself was born in 852, the daughter of Æthelred and his wife Eadburh who was from the Mercian Royal family. Ealswith married King Alfred the Great in 868 and they had seven children. Edward the Elder succeeded his father when he died in 899. After her husband died Queen Ealswith became a Nun within her own Abbey and died six years later. Edward the Elder and his third wife, Lady Edith of Kent's daughter, St Edburga, was Nunnaminster's most famous daughter. She became a saint not long after her death when she was around thirty years of age. Pilgrims visited her shrines at Nunnaminster and at Pershore in Worcestershire. It is not thought that Queen Ealswith was Abbess but her grandaughter may have been. The Abbey was a Benedictine order like the Old Minster. It was completed in 903 by Edward the Elder after his father had died. During the time of Ealswith and Edburga the Abbey would have been well endowed, but after that it had a chequered career of poverty and wealth. At times church clergy using the money for their own ends. With the problems of Tudor times the precious relics, or rotten bones according to King Henry VIII's Commissioners, were removed and the Abbey was all but vanquished. Pensions were granted to the Abbess and the Nuns. Gradually things deteriorated until now when only the foundations remain below the beautiful lawns and flowerbeds of tranquil Abbey Park, a haven away from the rush of the traffic. An excellent history of Nunnaminster can be found at British History online Very comprehensive indeed. Or you may wish to browse further, please do, you will find navigation buttons above on the left. Is open to the public daily. Take your sandwich in and have your lunch there. Go in for a quiet relaxing five minutes - or longer! Listen to the river chuckle, drink in the colours of the flowers, admire the Cathedral from that vantage point. Sit and plan the rest of your day. Is not open to the public, it is the residence of the Mayor of Winchester.